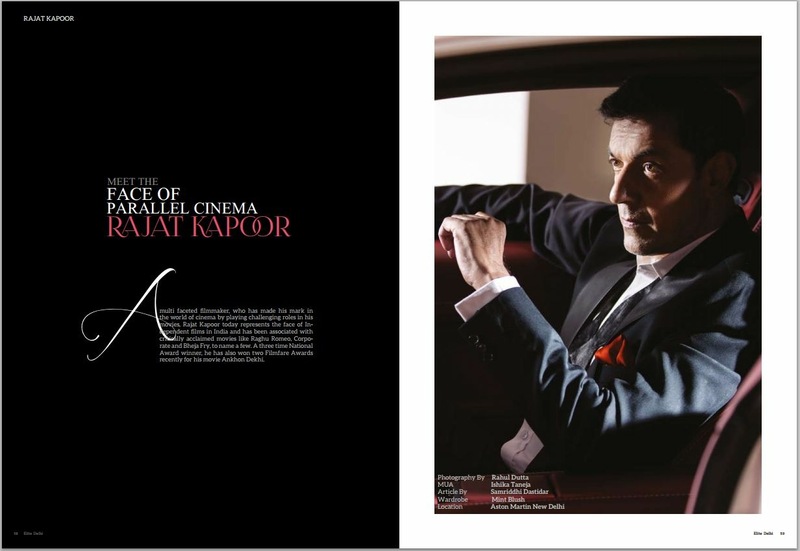 A multi faceted filmmaker, who has made his mark in the world of cinema by playing challenging roles in his movies, Rajat Kapoor today represents the face of Independent films in India and has been associated with critically acclaimed movies like Raghu Romeo, Corporate and Bheja Fry, to name a few. A three time National Award winner, he has also won two Filmfare Awards recently for his movie Ankhon Dekhi. 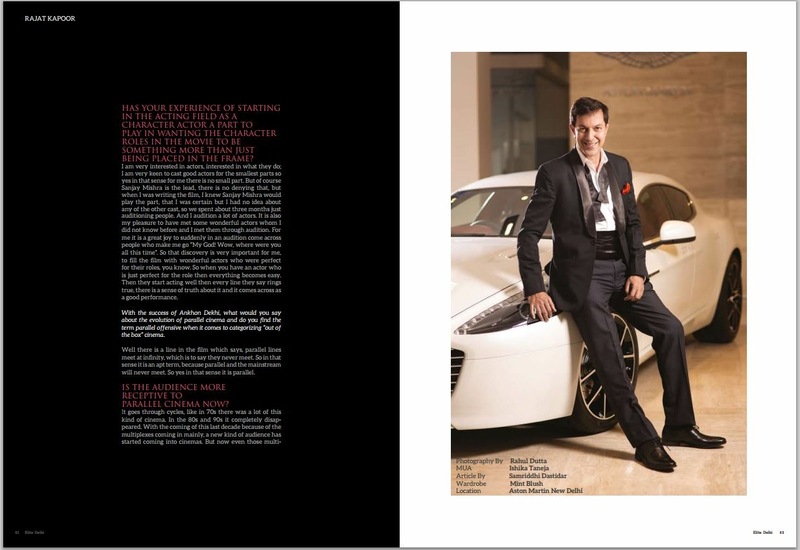 Our team caught up with him at the Aston Martin showroom in New Delhi for an exclusive shoot with Elite Delhi Magazine. 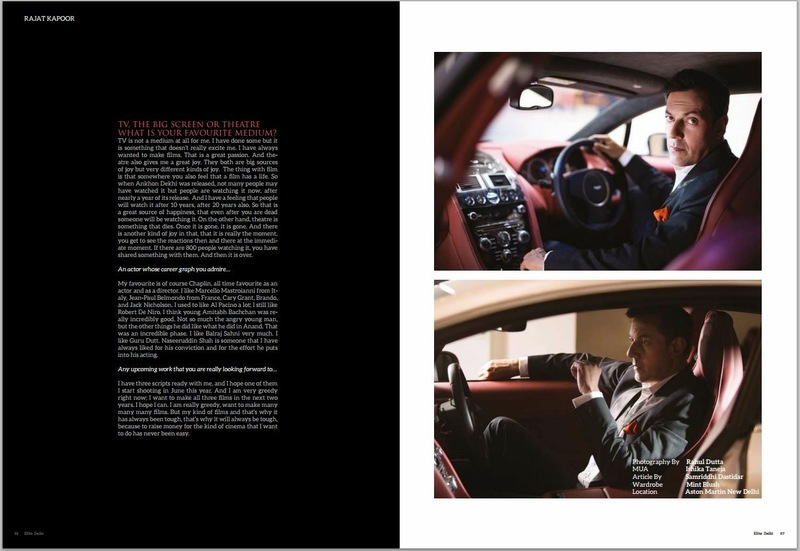 Dressed in a tuxedo, set against the backdrop of the Aston Martin Rapide S, Rajat Kapoor had an uncanny likeness to the iconic character James Bond. 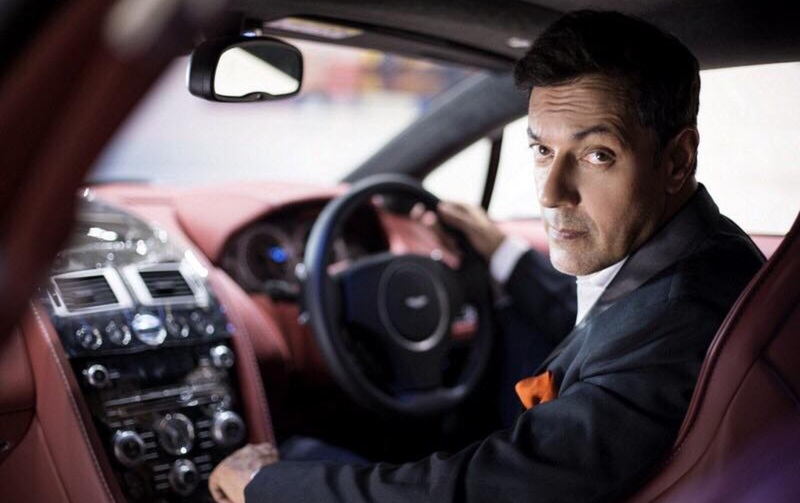 Bond, also referred to as Agent 007, has been linked to the British luxury sports car brand, Aston Martin, since the third bond movie, Goldfinger hit the big screens in the 1960s. Congratulations! Your movie Ankhon Dekhi has won the Best Filmfare Award (Critic) for the best film, the best story, and also the Screen Award for best story, did you expect this win or was it a complete surprise for you. In a way it was a surprise. Because normally these awards are very Bollywoody awards and they normally ignore independent cinema. So I think to be acknowledged by the fraternity is in a way a big deal. Though I must say this that awards are more a reflection of the jury than the film. The film is what it is. If it did not get any awards, it would still be a good film. If it gets an award, it does not become a better film. So, yeah that really doesn’t change what your film is or what your own perception of the film is, or what your own perception of your self is, that doesn’t change, but other people’s perceptions changes. So, they suddenly start taking notice. Each of the characters are very well developed in Ankhon Dekhi, did it take you long to develop them. I write very fast. But I must say that the idea was with me for about 10 years. This idea about a man who says he’ll only believe what he experiences that idea was with me for 10 years but I didn’t quite know how to make a script out of that idea, because an idea is an idea it is not a film. But then when I hit upon the joint family then the characters came very easily to me, then it took about 20 days to draft the script. And even the first draft was quite rich with people and all the mad characters. Has your experience of starting in the acting field as a character actor a part to play in wanting the character roles in the movie to be something more than just being placed in the frame? I am very interested in actors, interested in what they do; I am very keen to cast good actors for the smallest parts so yes in that sense for me there is no small part. But of course Sanjay Mishra is the lead, there is no denying that, but when I was writing the film, I knew Sanjay Mishra would play the part, that I was certain but I had no idea about any of the other cast, so we spent about three months just auditioning people. And I audition a lot of actors. It is also my pleasure to have met some wonderful actors whom I did not know before and I met them through audition. For me it is a great joy to suddenly in an audition come across people who make me go “My God! Wow, where were you all this time”. So that discovery is very important for me, to fill the film with wonderful actors who were perfect for their roles, you know. So when you have an actor who is just perfect for the role then everything becomes easy. Then they start acting well then every line they say rings true, there is a sense of truth about it and it comes across as a good performance. With the success of Ankhon Dekhi, what would you say about the evolution of parallel cinema and do you find the term parallel offensive when it comes to categorizing “out of the box” cinema. Well there is a line in the film which says, parallel lines meet at infinity, which is to say they never meet. So in that sense it is an apt term, because parallel and the mainstream will never meet. So yes in that sense it is parallel. Is the audience more receptive to parallel cinema now? It goes through cycles, like in 70s there was a lot of this kind of cinema. In the 80s and 90s it completely disappeared. With the coming of this last decade because of the multiplexes coming in mainly, a new kind of audience has started coming into cinemas. But now even those multiplexes are being appropriated by mainstream cinema. So now when any big film, or not even a big film, is released, they come in 3000 screens, so the whole space is taken away. Then you end up getting one show at 3:30 pm, one show at 7:00 pm, that’s it. So it is still a tough fight for its exhibition, in fact it has become tougher now. It was a little easier in 2005‐2006, when I made Mixed Doubles and Bheja Fry; there was a possibility of getting screens. Today even though you spend 2‐4 crores, if your film doesn’t have a star you don’t get shows, that’s how mainstream cinemas always worked unfortunately. Do you ever see yourself working in a movie which has a star? If there is the need for it I don’t mind, I would love to work with all the big stars but I write stories where they don’t really fit. Would you write a story which is more geared towards the mainstream audience? No because that is not my interest at all. I don’t want to make a silly film which means nothing. Do you think a film which is “intelligent” is ever going to have takers when it has what they call a bit of masala? Give me an example (I pause slightly)… you had to think. That is the problem that is the answer, because there aren’t any. And if you are giving into masala, you are giving into masala. Then you are making a certain type of film. And that means you are betraying your own integrity and that is something I don’t want to do. Was it difficult switching to and fro between the roles of an actor and being the director for Ankhon Dekhi? Not at all! Because when you are directing, it is completely your film, completely your baby. You spend 2 ‐3 years on it, so when you are acting, your job is very simple. There is 20‐30 days’ work in a film and you are off. So there is no switching from this to that, this is one job and that is another job. They are different things. TV, the big screen or theatre what is your favourite medium? TV is not a medium at all for me. I have done some but it is something that doesn’t really excite me. I have always wanted to make films. That is a great passion. And theatre also gives me a great joy. They both are big sources of joy but very different kinds of joy. The thing with film is that somewhere you also feel that a film has a life. So when Ankhon Dekhi was released, not many people may have watched it but people are watching it now, after nearly a year of its release. And I have a feeling that people will watch it after 10 years, after 20 years also. So that is a great source of happiness, that even after you are dead someone will be watching it. On the other hand, theatre is something that dies. Once it is gone, it is gone. And there is another kind of joy in that, that it is really the moment, you get to see the reactions then and there at the immediate moment. If there are 800 people watching it, you have shared something with them. And then it is over. My favourite is of course Chaplin, all time favourite as an actor and as a director. I like Marcello Mastroianni from Italy, Jean-Paul Belmondo from France, Cary Grant, Brando, and Jack Nicholson. I used to like Al Pacino a lot; I still like Robert De Niro. I think young Amitabh Bachchan was really incredibly good. Not so much the angry young man, but the other things he did like what he did in Anand. That was an incredible phase. I like Balraj Sahni very much. I like Guru Dutt. Naseeruddin Shah is someone that I have always liked for his conviction and for the effort he puts into his acting. I have three scripts ready with me, and I hope one of them I start shooting in June this year. And I am very greedy right now; I want to make all three films in the next two years. I hope I can. I am really greedy, want to make many many many films. 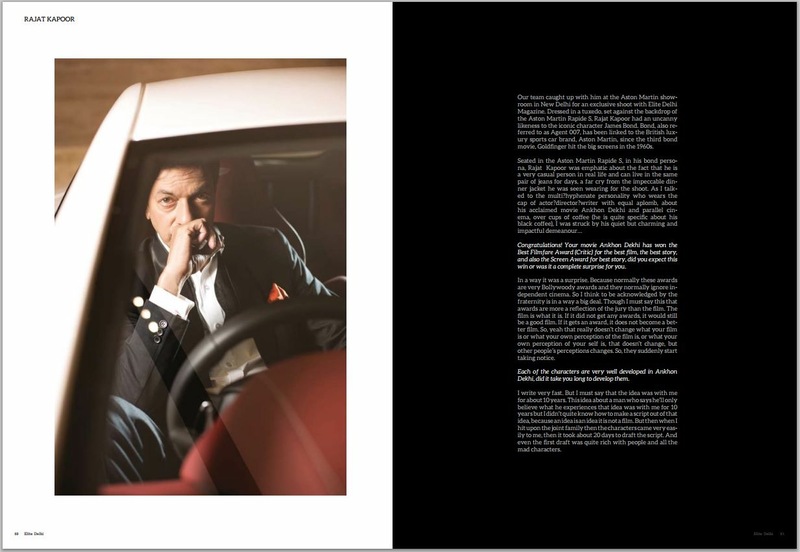 But my kind of films and that’s why it has always been tough, that’s why it will always be tough, because to raise money for the kind of cinema that I want to do has never been easy.